Perhaps the most venerable of tree fruits, the pear is luscious, but can be difficult. Maybe, say some, the Washington pear needs some new blood. Ray Schmitten ’85 and I stand on a grassy bench above the Wenatchee River Valley, a forest of Anjou pears at our back, as he points and talks about the interplay between his family and the landscape of the valley. In 1897, his great-grandfather had a sawmill up Brender Canyon. He started out taking the mill to the timber. “He moved up to that ridge and logged it out. Finally in 1921, he moved the mill and everything down here and bought that old logging truck in my driveway. Schmitten’s grandfather and great uncle then took over the family operation. They also hated the farming part of it, he says. They liked the industrial part, the milling. Then Schmitten’s father joined in. He liked the farming part, a preference that has played a major part in the Wenatchee River Valley in defining the Anjou pear—and in the Anjou defining pear production in the valley. Over the years, Anjou has become the dominant variety for the valley, for a number of reasons. For one thing, it stores well. Even before refrigeration, says Schmitten, the Anjou would store for six to eight months. But the Anjou’s appeal goes far beyond storability. What gives the Wenatchee growing district its advantage over other areas in growing pears is the same thing that gives it the advantage for apples and grapes and just about any other crop. And that’s control of water. Here in the eastern foothills of the Cascades, the climate is desert. But desert supplied by abundant water. Three separate irrigation systems feed the orchards along the Wenatchee. Even up here, a thousand feet above the valley floor, irrigation canals wind their way around the convoluted slopes. Because of the area’s climate, fire blight, the bacterial scourge of pears, is not such a dramatic problem as elsewhere. Which means fewer chemicals to control it. Mildew, which occurs in more humid growing areas, is almost unheard of in the area, says Schmitten. Along with the control of water come the temperature swings. Hot days and cool nights mean great sugars. And then, whether it’s a complicated combination of these factors or something yet unidentified, the Washington Anjou has the smoothest finish. Any pear aficionado understands “melting.” And when the Anjou is perfectly ripened, the melting finish is perfectly smooth. THE PEAR AND THE APPLE, though of the same biological family (Rosacea), are two completely different fruits. In fact, if we thoroughly understood our fruit as a culture, we might express dissimilarity by comparing “apples to pears” rather than “apples to oranges.” Though admittedly, the apple/pear comparison would hold more delicious ambiguity. The apple is approachable, friendly, and immediate. You can pick an apple ripe from the tree or buy one at the grocery store and bite into it and be immediately rewarded. Most modern varieties of apples are straightforward, rewarding one primarily with varying proportions of sweet and tart and a bracing mouth feel. Apples make you feel good. So of course will the pear. But the pear, in contrast, can be elusive and mysterious. Sophisticated. One must carefully time the eating of a pear. Whereas an apple is, ideally, picked when ripe, a pear actually ripens better when picked mature, but not ripe. In order to achieve perfect ripeness, it must ripen off the tree in storage. Most commercial apples are young. The popular Honeycrisp was released in 1991. Even the seemingly venerable Granny Smith was introduced to the world a mere 90 years ago. Pears are earthy and old. The two dominant varieties grown in Washington are the Anjou and the Bartlett. The Anjou, or Beurre d’Anjou, is believed to have been introduced in the early to mid-19th century; the Bartlett, more properly known as the “Williams bon chretien,” probably in 1765. Newer varieties have simply not caught on. The pear demands, but then rewards, patience. It does not generally offer immediate gratification. But the payoff is luscious and profound. To ripen a pear, simply leave it out at room temperature. If you want to hasten ripening, you can put it in a bowl with bananas, which produce a lot of ripening ethylene, or in a paper bag, which will concentrate the pear’s own ethylene. The Anjou did not conquer the Wenatchee Valley all at once. Anjous are not entirely alone up here. Pears, under ideal conditions, can be self-fertile. That is, they do not, technically, need another pollenizer variety to bear fruit. But another variety helps. Which is why the Bartlett is interspersed amongst the dominant Anjous. The earlier ripening Bartlett is a fine pear. For many people, the Bartlett defines pear taste. But they do not winter well up here. Temperatures below zero will damage a Bartlett tree. “After a bunch of winter freezes, we ended up with more Anjous than Barletts,” says Schmitten. Which is how the slopes and benches above the Wenatchee River came to be Anjou heaven. So well are the Anjous entrenched, in fact, that it can seem that the entire valley and its orchards are stuck in the past. “Those trees are right around 80 years old,” says Schmitten, nodding toward a block of gnarled, wizened trees. In contrast to the younger trellised apple orchards downriver, the orchards of the Wenatchee Valley are like another country. And when you harvest fruit from 100-year-old trees, which many do, you think differently, at least in terms of time. Also, much in contrast to the large apple orchards to the southeast, much of the pear acreage is on steep slopes. Two acres here, says Schmitten, five acres there, half an acre there. Twisting narrow lanes lead to ever higher patches of orchard. “It’s a management nightmare,” says Schmitten, “so it takes people who’ve got a little more patience. They’ve got to understand a little bit about everything. Apple growing and pear growing are about as different as, well, apples and pears. But because of this difference, some Washington growers fear the pear industry is losing its grip. The key to the success of the modern apple industry is the dwarfing rootstock. Neither apples nor pears “breed true.” The only way to propagate a variety, say the Anjou or Golden Delicious, is to graft a piece of “scion” wood from the chosen variety onto a separately grown rootstock. Although the scion determines the variety, the rootstock generally controls the tree’s vigor and other traits. Although dwarfing rootstocks have been used for centuries to control the size of apple trees, the super-dwarfing ones generally were developed in the last half-century. The occasional standard-size orchard still exists in central Washington, but most orchardists have moved to trees so dwarfing that they are grown on trellis systems like grapes. The primary advantages are they are easy to manage, they produce apples quickly (often within the second or third “leaf”), and because there is far less wood and long branches, they are far more efficient in terms of fruit produced in a given space. Although an apple variety may take 12 to 14 years to develop, once it meets the breeder’s expectations, it can be introduced within a few years on dwarfing rootstock. If the market’s taste for a certain variety changes, that variety can be grafted onto dwarfing rootstock and quickly, at least relatively speaking, propagated. Most pears, on the other hand, are planted on a limited number of only semi-dwarfing rootstock. Pears grafted to the commonly used OHF87 rootstock, for example, will produce a tree that is about 80 percent the size of a standard pear tree and will mature and pay for itself in about 14 years. Most of the pear trees around Cashmere and throughout the Wenatchee Valley were planted on standard size seedling rootstock as long as 100 years ago. Also, because of their age, many of the orchards were laid out to accommodate horse-drawn sprayers and wagons and are very difficult to spray and manage efficiently. In response, some growers, such as Schmitten, are urging the development of new rootstocks so that the industry can meet changing market demands. 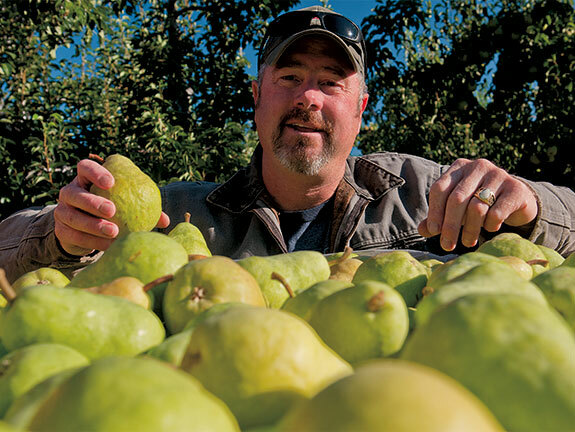 Others, such as Chuck Peters in the Yakima Valley, believe the emphasis should be on developing new varieties to supplement the Bartlett, which is dominant in the Yakima Valley and most of which traditionally have gone to processed pears. That market has shrunk dramatically as “fresh” pears have become available year round, whether from Washington storage or Argentine and New Zealand orchards. Kate Evans was hired to be a “pome” breeder. Pomes are, generally speaking, the fruits of flowering plants within the Rosacea family. But for all practical purposes, pome breeding means apples and pears. And in Evans’s case, for all practical purposes, this has meant apples. largest producer of pears in the United States, apple production far surpasses that of pears, which means apples get most of the attention. And research dollars. What money there is, the Yakima Valley growers would like to see dedicated to developing new varieties. The Wenatchee Valley growers, some of them, anyway, would like new rootstocks. And then there is a contingent of pear farmers, primarily in the Wenatchee Valley, who see no need for new rootstock or varieties. Eighty-year-old Anjous on seedling or OHF rootstocks have served them quite well, thank you very much. Schmitten is not entirely unsympathetic. Back at his house, he gestures toward a block of pears adjoining his yard. He’s been wanting to take it out and replant it with smaller trees, primarily to address labor issues. Evans, who has been very busy developing and releasing a line of new apple varieties, looks a bit weary as she expresses her desire to work on pears. But like so many things, it boils down to a question of money. She also understands the pear culture as a curious conundrum. But she also sympathizes with the need for change. A major issue within existing pear orchards is labor, which is multi-problematic. The largely Hispanic labor force is aging and shrinking. The need for apple pickers competes with pears. The shorter, trellised apple orchards are far easier to pick and better paying. Pear orchards still require ladder work. Pears are heavier than apples. And the one major pest of the Wenatchee Valley orchards, the pear psylla, can make picking miserable. Pear psylla produce a sticky honeydew. Picture perching on a 12-foot ladder with a very heavy bag of pears hanging from your shoulders and everything is coated with honeydew. Who wouldn’t rather move down valley and pick apples off a six-foot-high trellised tree? All of those problems could be corrected with smaller pear trees. Management is an additional, and overwhelming, issue. “Spraying in these big trees is a nightmare,” says Evans. “You can’t target your spray, so the volume of spray is horrendous. “Integrated pest management systems, all the things that have developed on the apple, you can’t really do so well in a pear orchard, because the whole pear orchard culture, the whole structure of the tree” is not amenable to modern practices. There is some movement on the horizon. In August, Stefano Musacchi will be joining Evans at the Tree Fruit Research Station in Wenatchee. A plant physiologist from Italy, Musacchi has bred some pear scions and rootstock and will bring some of his material with him. Meanwhile Evans has tried to source material from breeding programs in France and Great Britain. Amit Dhingra will be conducting comparative genetics work in a move to characterize that material. Chuck Peters ’61, ’65 MS is frustrated to no end. He has targeted “RosBreed,” a multi-university genetic initiative aimed at improved breeding of fruits within the Rosaceae family. Apples, raspberries, … sweet cherries, sour cherries. “Sour cherries!” says Peters, astounded. No, he has nothing against sour cherries. But they are hardly a significant crop for Washington. But sour cherries and no pears? Yes, pears have disappeared from the RosBreed prospectus. “We’re years behind the rest of the world,” he says. At 75, Peters is officially retired. But he is still active in oversight of his orchards, in following fruit research and breeding worldwide, and most definitely, letting his opinion be known. 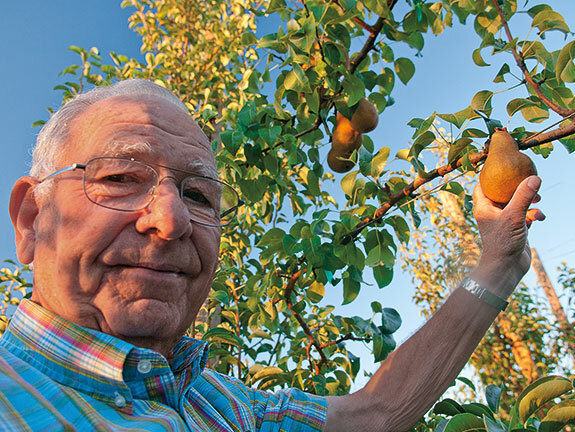 Peters ’61 and his wife Cathy live in a lovely 1920s cottage style house in the Yakima Valley, just up the road from Wapato, in the midst of orchards, which he would prefer be more pears. The pear block that was until recently across the road is now an open field. It was originally planted to pears in 1898. “That should be pears,” he says of the empty field. “But no, it’s going into apples, and it’s going into red delicious! The pear orchard that is now gone was actually planted two years before the irrigation systems were available, says Peters. The landowner hauled water from the Yakima River in wooden tanks and kept them alive until irrigation arrived. After finishing his master’s in horticulture at WSU and working for four years at Colorado State, Peters returned to the farm in 1966. His son joined him in the early 1990s. In 2002, they downsized to the original homestead of 60 acres, three-quarters of which is pears. Like most pear growers in the Yakima Valley, Peters grew primarily Bartletts for processing and drying. But canneries are closing, says Peters. The only market for canned pears anymore is institutional. Canned pears can be quite good, often much better certainly than the off-season “fresh” pears that we consumers are assumed to insist on. The best way to generate a larger market for pears is to develop new varieties, says Peters. But there is only one pear breeding program in the country, a USDA program in, of all places, West Virginia. 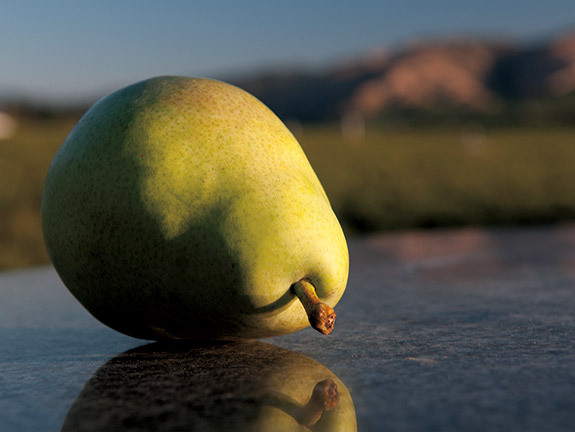 The vast majority of U.S. pears are grown in Washington, Oregon, and northern California. “The two pears sitting over there, we bought on Sunday,” says Peters. Now it’s Thursday, and they’re not yet ripe. Cathy slices the two Anjous and brings them over to the table. The flesh is nicely melting for a pear in July. But it has no flavor. “Tell Ray about this,” jokes Cathy. As a matter of fact, Ray had retrieved a couple of pears from his house at the end of our orchard tour. Anjous, of course, they represented the latest attempt to provide a delicious pear after months of storage. Each was encased in a separate clear plastic clamshell to concentrate the ethylene production of the pear and enhance its ripening. Unfortunately, stored pears are not always so good. Storing a pear presents enormous challenges, and the tradeoffs are clear. Indeed, at the heart of the pear’s problems is that of ripening after storage. Amit Dhingra plans to solve that problem. 1-MCP, short for 1-Methylcyclopropene, is a synthetic plant growth regulator that is used to slow down fruit ripening. It is related to the plant hormone ethylene, which is used to hasten the ripening process. The growth regulator has been used successfully in apples. That is, the treated fruit remains crisp and juicy. Unfortunately, the apple’s aroma disappears. Even so, goes the thinking driven by our desire for year round availability, pears are like apples. Let’s try some 1-MCP. So Dhingra and his lab discovered compounds that can reverse the effect of 1-MCP. 1-MCP blocks aromatic pathways in the pear. Their compound reactivates the pathways and reverses the impact of 1-MCP. The compound is being tested commercially. There is hope also in the genomicist’s toolkit for speeding up the process of creating new varieties and rootstocks. Dhingra and colleagues have already released a map of the pear genome. With a good map of the pear’s genes in hand and further mapping of flavor, resistance, and other trait markers, breeders like Evans can proceed with their exploration with a little more confidence and speed. Dhingra’s laboratory is also developing methods of micropropagation and other tools, which have been commercialized into a company. “Everything is directly available to farmers,” says Dhingra. One of his graduate students is director of operations. Having laid out the need for change, however, let us at least briefly consider another perspective, one that is suggested by some farmers’ reluctance and even the ambivalence of Evans and Schmitten and others. There is something at least nostalgic, if not romantic, even magical, about those lovely 100-year-old pear trees above Cashmere. There is also something romantic about anachronism, in this case not only the orchards themselves, but the way of thinking that they produce and are a result of. Schmitten talks about a neighbor who continues to plant pears on OHF97 rather than the more dwarfing OHF87 because production of the trees on the latter starts to fall off after about 30 years. In a culture seemingly in continuous flux, such a long-term way of thinking is refreshing.